One of the few farms in Argyll to raise and finish their own cattle, Barbreck is situated on rich, low-lying pasture at the head of Loch Craignish, around 20 miles south of Oban. Calves are suckled until 10 months old and fed home-produced silage when wintering in sheds, before being butchered on site. Barbreck's lambs are raised on their mother's milk and herb-rich hill pastures, and both meats are available from their website and in the farm shop, alongside seasonal pork from Mull and local venison. They also stock fruit and veg (in season), free range eggs and home baking, as well as smoked fish, local cheeses, a range of preserves and a selection of books and crafts. The local touch that makes shopping at farm shops so worthwhile means that they're happy to help you source products as well, if they don't have them in. The online shop has a good selection of their meats, and they'll deliver personally if you live within 25 miles - this means you can also buy eggs, fruit and veg and baking direct from the van. 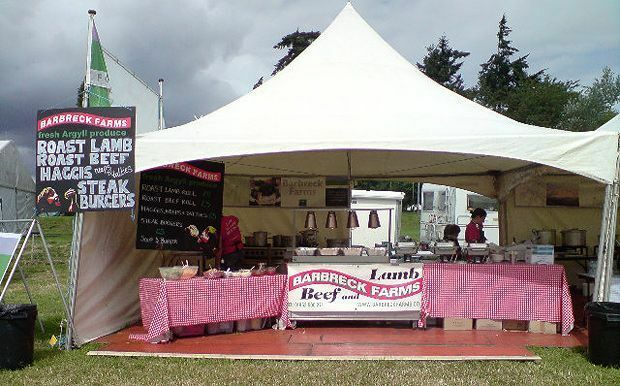 Barbreck meats can be found locally at village stores locally, as well as on the menus of the Crinan Hotel, Loch Fyne Oyster Bar, Melfort House and the Horseshoe Inn, among others, and at Campbeltown and Lochgilphead farmers' markets.